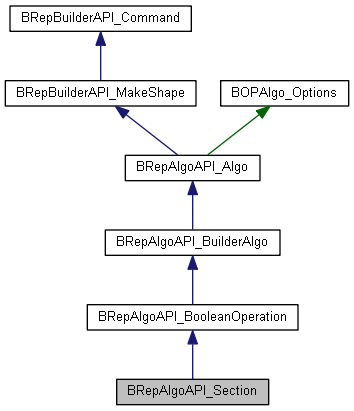 Empty constructor <PF> - PaveFiller object that is carried out. Constructor with two shapes <S1> -argument <S2> -tool <PerformNow> - the flag: if <PerformNow>=True - the algorithm is performed immediatly Obsolete. Constructor with two shapes <S1> -argument <S2> -tool <PF> - PaveFiller object that is carried out <PerformNow> - the flag: if <PerformNow>=True - the algorithm is performed immediatly Obsolete. Constructor with two shapes <S1> - argument <Pl> - tool <PerformNow> - the flag: if <PerformNow>=True - the algorithm is performed immediatly Obsolete. Constructor with two shapes <S1> - argument <Sf> - tool <PerformNow> - the flag: if <PerformNow>=True - the algorithm is performed immediatly Obsolete. Constructor with two shapes <Sf> - argument <S2> - tool <PerformNow> - the flag: if <PerformNow>=True - the algorithm is performed immediatly Obsolete. Constructor with two shapes <Sf1> - argument <Sf2> - tool <PerformNow> - the flag: if <PerformNow>=True - the algorithm is performed immediatly Obsolete. Performs the algorithm Filling interference Data Structure (if it is necessary) Building the result of the operation. Indicates whether the P-Curve should be (or not) performed on the argument. By default, no parametric 2D curve (pcurve) is defined for the edges of the result. If ComputePCurve1 equals true, further computations performed to attach an P-Curve in the parametric space of the argument to the constructed edges. Obsolete. Indicates whether the P-Curve should be (or not) performed on the tool. By default, no parametric 2D curve (pcurve) is defined for the edges of the result. If ComputePCurve1 equals true, further computations performed to attach an P-Curve in the parametric space of the tool to the constructed edges. Obsolete. Sets options (available in child classes) for the intersection tool. Here it does nothing.